However you plan it, visit the wonderful parks in the Pennsylvania Wilds that have a little bit of everything. For reservations and information call 1-888-PA-PARKS or visit PA State Parks. Bilger’s Rocks is a 300 million year old rock formation with on-site trails, camping area, pavilion, outdoor stage, playground and concession stand. The whole family will enjoy the time you spend here. Upon entering the many acres of massive rocks, one often feels an eerie sense of being transported through time and space to another era and a different place. You meet with what appears to be a hidden world of mazes, paths and caves leading in all directions, beckoning and inviting you to stay and explore. You find yourself captured and pulled forward by the possibilities and mystery of this unique setting. Shielded in this fantastic vivid landscape by walls of huge megalithic stones, extraordinary hanging vegetation and bizarrely shaped byways, one's imagination is drawn to an exciting adventure of discovery. Things of all stripes, colors and contrast can be found throughout the formation. Light, shade and temperature, take on new meanings as you move through this unusual, ancient geological environment. Most folk's experiences are defined by their own personal expressions of wonder, surprise and engagement in a visit to Bilger's Rocks. Oftentimes, it's a primitive and spiritual feeling of awe, reflected by being in, and part of, such a timeless and ageless vista of our earth and its formation over the age. 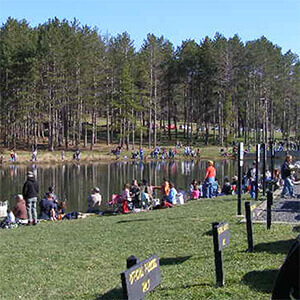 The Curwensville Lake Recreation Area is 362 Acres of recreation land that offers many opportunities to entertain the whole family. 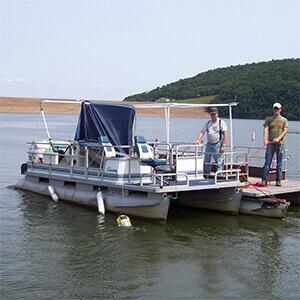 Biking, hiking, boating, camping and fishing are just a few of the activities available at Curwensville Lake. You will find 2 sand volleyball courts, 7 hiking trails, no horsepower restriction boating, athletic fields, sand beach, boat launch and marina, 52 electric campsites, group camping and more. The splendor of our National Bird, the Bald Eagle, can be captured on film or in your mind’s eye as the Lake is host to a family of Bald Eagles. Curwensville Lake Recreation Area is the Natural Choice. The Moshannon State Forest contains about 187,000 acres running across northern Clearfield County and overlapping into Cameron and Elk Counties.The Moshannon State Forest offers a wide variety of dispersed recreation such as primitive camping, nature viewing, fishing, hunting, geocaching, mountain biking, sightseeing, and seasonally cross country skiing, and snowmobiling opportunities. The Quehanna Wilderness Area is shared between the Moshannon and the Elk State Forests and offers nearly 50,000 acres of peace and solitude to area visitors. The area is an important bird and mammal area as designated by the respective nature societies. Glimpses of elk are often possible if visitors show up at dawn and/or dusk. The Quehanna Trail is a 75-mile hiking trail traveling through the forest’s upland oaks and ground cover of Mountain Laurel, huckleberry and Sweet Fern. It winds up and down hardwood covered slopes into Rhododendron thickets among boulder fields and crossing cascading clear mountain streams. There are over 200 miles of forest roads to help visitors access the beauty and recreation opportunities afforded by the forest setting. For more information about Moshannon or other State Forests call 814-765-0821 or visit http://www.dcnr.state.pa.us/forestry/. Parker Dam State Park is more than just a State Park. The 968-acre Parker Dam State Park offers old-fashioned charm and character. A scenic lake, rustic cabins, quaint campground and unbounded forest make Parker Dam an ideal spot for a relaxing vacation. For wilderness explorers, Parker Dam is a gateway to the vast expanses of Moshannon State Forest. You can walk through recovering tornado ravaged woods, backpack into the 50,000-acre Quehanna Wilderness, mountain bike to your heart’s content or enjoy quiet solitude searching for elusive Pennsylvania elk. Parker Dam State Park offers year-round environmental education and interpretive programs. Through hands-on activities, guided walks and evening programs, participants gain appreciation, understanding, and develop a sense of stewardship toward natural and cultural resources. A small-scale, interpretive maple-sugaring operation runs throughout March. Apple-cidering is demonstrated each October. Curriculum-based environmental education programs are available to schools and organized groups. Group programs must be arranged in advance and may be scheduled by calling the park office at (814)765-0630. Teacher workshops are available. A small, environmental education center, attached to the park office, offers interpretive displays, games and children’s books. The Lou and Helen Adams Civilian Conservation Corps Museum near the breast of the dam educates visitors about the life and times of the corps members. It is open Sunday afternoons during the summer season or upon request. Wayside exhibits interpreting the tornado are outside of the Cabin Classroom. Rock Run Recreation is the Premier ATV Recreation Park east of the Mississippi. With over 6,000 acres and trails for all challenge levels- from easier “family ride” to black diamond trails there is something for everyone. There are 140 miles of trails for what every type of machine you prefer: ATV, Side by Side, OHV's or dirt bikes are welcome. Rock Run Recreation is located in the majestic Allegheny Mountains with I-80 access via Clearfield and DuBois. If you want a park where the pace of nature is the pace of life, visit historic S.B. Elliott State Park. Conveniently located off of Exit 111 on Interstate 80, this central gateway to the Pennsylvania Wilds is a place where visitors can stretch their legs or stay for awhile in one of 25 campsites or six rustic cabins. Home to one of the state’s National Historic Sites for Civilian Conservation Corps architecture, the park gives visitors a chance to step back in time. Break out your GPS unit and take a self-guided historic geo-tour. Learn the history of reforestation efforts at the Dague Nursery located by the park entrance. S.B. Elliott State Park is a hub for the extensive snowmobile opportunities in the area. Swinging by during the summer? For an extra treat, plan your trip around High Country Festival in July. For reservations and information call 1-888-PA-PARKS or visit www.dcnr.state.pa.us. There are 29,223 acres of State Game Lands in Clearfield County. Below is a list, by number, area and number of acres. State Game regulations apply to all recreational visitors. The Quehanna Wild Area is the first state forest wild area in Pa. and is a 48,000-acre almost circular patch of small second-growth mixed hard wood forest. The Quehanna Wild Area is for the public "to see, use and enjoy for such activities as hiking, hunting, and fishing". The main hiking trail on the Quehanna plateau is the Quehanna Trail, a 75-mile (121 km) loop trail that passes through the wild area and Moshannon and Elk State Forests. One of the notable features of the natural area is a large stand of paper birch, giving the impression of a much more northerly forest. A reliable place to find snow for cross-country skiing is the Quehanna Cross-Country Ski Trail which goes through the heart of the natural area. There are large open meadows too, which support exceptional wildflowers in spring and summer. Wopsononock Natural Area is 588 acres of land, with protected watershed areas, that is open to the public. There is a large parking area at the entrance. This parking area is great for equestrian trailers. Enjoy hiking, horseback riding, mountain biking, hunting and wildlife watching---keep your eyes open and you might see eagles, hawks, bears, and deer. Wopsey, as it is called by the locals, is a walk in only area that is restricted to day use. There are no amenities onsite. Fires and motorized vehicles are prohibited. Adjoining land owners have posted property so be sure to have a map of the area and watch for signs. Wopsey is a great place to spend the day enjoying nature. Site designed by Lunar Cow Publishing.